The Associated Press’s David Guttenfelder is providing an iconography of the North Korean regime in his recent photo coverage. 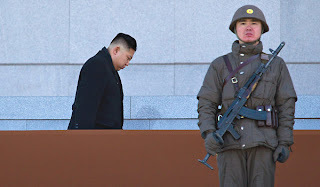 His photo accompanying the recent story “Shift Expected as North Korea Sets Party Meeting,” (NYT, 2/20/12) shows Kim Jong-un, the son and successor to the recently deceased Kim Jong-il at what the caption describes as “a military review and commemoration of his late father’s 70th birthday.” But in this case, the picture really does speak a thousand words. Guttenfelder would have done Erwin Panofsky, the German art historian, proud. Panofsky was the author of such classics as Studies in Iconology: Humanistic Themes in the Art of the Renaissance (1939), from which the study of iconography has gained its currency. Kim Jong-un is shown in a profile shot that accentuates his jowls and a sporty new haircut, buzzed at the sides. Add a gold chain and he could easily have been a character on Jersey Shore. He is bent in a meditative pose with his eyes cast down at the ground, a lone figure on the rostrum. Only a stolid soldier, with an AK-47 strapped across his chest, stands at attention in front of him. 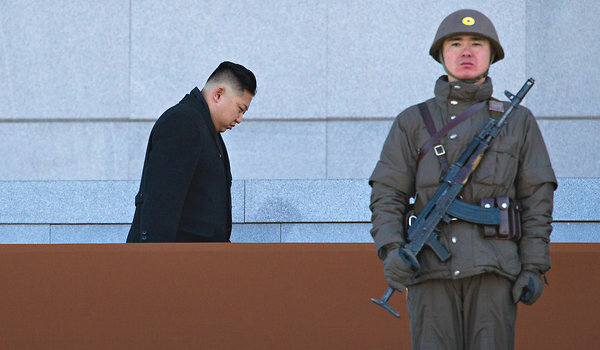 The soldier doesn’t exist for Kim Jong-un and the potentate is not even within the soldier’s field of vision. Though near in space, the gap between the soldier and the head of state is emphasized by the way in which Guttenfelder makes it apparent both are almost ornamental figures who have no idea of each other’s existence. “On Thursday, American and North Korean officials are to meet in Beijing for the first senior level talks since October,” Choe Sang-Hun’s story Times story reads. But what really is running through the mind of the lone figure, the stout young man with the Maoist morphology, who Guttenfelder portrays?